Image Size: 30"w x 19"h.
Somewhere, over the shoulder, out there, an enemy of unknown numbers begins their attack in quest of gold, payroll or passenger's jewels. The cavalry troopers and stagecoach driver galvanize into immediate action. All in an arid landscape of time-worn rocks, dust that obscures the unseen adversary and a heat shimmer that accentuates that this cast of characters in a race with mortal danger. Frank McCarthy knew from an early age that his passion was art, copying from his favorite comic strips. Encouraged by his parents and art teachers, he enrolled at fourteen in New York’s Art Students League, studying first under George Bridgeman and then under Reginald Marsh. After high school graduation, he studied for three years at Brooklyn’s Pratt Institute with a major in illustration. Following his studies, McCarthy embarked on his art career as a commercial illustrator in New York City. He painted illustrations for most of the paperback book publishers, magazines, movie companies and advertisements. He created works that became posters for such movies as the James Bond series. Frank McCarthy’s talents were highly sought-after by art directors enabling him to work as a free lance illustrator for many years. His art career spanned over 50 years, beginning with a request for a western cover for a magazine by an art director. He left the world of commercial art in 1968, and began his fine art career after moving to Sedona, Arizona. Frank McCarthy’s dynamic paintings frequently featured the people of the west with a special emphasis on the Plains Indian, mountain men and cavalry that comprised the lore and lure of the Old West. Appropriately entitled the “Dean of Western Action Painters,” Frank McCarthy’s art was unsurpassed for its motion, drama and absolute attention to accuracy and detail. Highly collected and frequently imitated, Frank McCarthy’s works were treasured throughout the world as classic examples of contemporary Western Art. Retrospective showings of Frank McCarthy’s paintings have been held at the Museum of the Southwest, Midland, Texas; the R.W. Norton Museum in Shreveport, La. ; the Thomas Gilcrease Museum in Tulsa, Ok.; and in 1992, at the Cowboy Artist of America Museum (now known as National Center for American Western Art) in Kerrville, Texas. Frank McCarthy was invited to join the prestigious Cowboy Artists of America organization in 1975 and was an active member in the CAA group for 23 years. 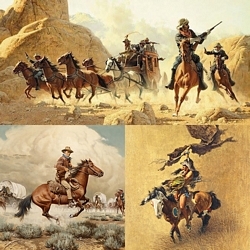 He was inducted into the Society of Illustrators Hall of Fame in 1997 Three books of his paintings have been published-The Art of Frank C. McCarthy, Frank C. McCarthy, Fifteen Anniversary commemorative and The Old West, a leather-bound Collector’s Edition. More than 100 limited edition art prints of his paintings have been published since 1974 by The Greenwich Workshop. McCarthy passed away in 2002 at his home of 30 years in the beautiful red rocks of Sedona, Arizona.